All part of the cycle. a start necessitates a closure. The tims is nigh for the conclusion. Mages aspire to greatness, and none more so than those who craft their souls with the techniques of the sublime—legacies that invoke awe and terror. Legacies: The Sublime details 13 all-new legacies, the specialized magical paths that result from soul-shaping and grant unique mystical attainments. Each legacy features a detailed history and organization along with its own unique attainments. 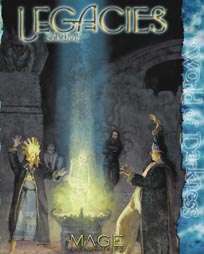 Legacies: The Sublime also provides complete rules for designing your own legacies. * Two all new "techgnostic" legacies, for mages who mix magic and technology. This title was added to our catalog on January 23, 2006.